Now I try to dispel the image that Muslims and Arabs suffer from – mostly by our own doing I have to say – in the rest of the world. I am no missionary and don’t want to be. I run several internet websites that are geared to do just that, create a better understanding that we’re not all nuts hell-bent on world destruction. I hope that I will be judged that I made a small difference. Among the above list, only Mahmood’s blog is a Bahraini. Other web sites vary between news, religious and entertainment web sites. Usually, no explanation is given to the web sites owners about the reason their web sites are blocked. However, looking at the official memo, it refers the press law no. 47, passed in 2002, which then added further restrictions on freedom of expression including the prohibition of “defamation of the person of the king and royal family members.” On 24 April, 2005, the Information Ministry issued a decree instructing web site and blog moderators of any site that included information on Bahrain to register with the Ministry and to assume responsibility for all materials published online. Mahmood suggests that all the sites blocked are ones that published information on “the Jamal Dawood scandal”. Dawood is the head of Press and Publication for the Bahrani government and has been involved with part plans to order all Bahrani bloggers to register their online presences. He’s evidently implicated in “Bandargate“, a scandal named after Salah al-Bandar, the Sudanese/British author of a report that documents attempts to rig parliamentary elections in favor of the Sunni minority. 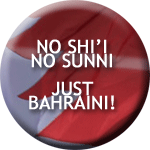 I support a ONE Bahrain! Mahmood’s blog is already mirrored at Alyousif.tv and is accessible to Bahrainis via that address – as a petition campaign and banners circulate on the net, it will be interesting to see whether the bad publicity for the nation helps make the block of Mahmood’s blog a brief one. This entry was posted in Developing world, Global Voices, Human Rights. Bookmark the permalink. Yey! The name of my country shines with pride anywhere the words censorship, block or ban are found! Way to go Bahrain!